Unfortunately for a person whose plan for the summer was “write as much as possible”, I’m finding myself largely unable to write anything – academic, fiction, or even blog posts. I couldn’t even muster up anything intelligent to say yesterday about St Olaf of Norway (whose feast day it was) although he's interesting to me for any number of reasons: chiefly, being a Scandinavian saint who was culted in medieval England (there are several churches named after him, including a good number in London), being both an ex-Viking and a royal saint, and being one of the opponents whom awesome badass Cnut comprehensively routed on the way to acquiring his empire. Oh well; perhaps another time. Instead, here's a picture of a medieval priest. It's from the church of Brookland in Kent, which also has an interesting thirteenth-century wall painting of the murder of Thomas Becket and an unusual Norman font, but I'll post about those when I can put complete sentences together. Medieval floor tiles in the parish church of Muchelney, Somerset. The tiles were moved to the church from the nearby abbey, which is now in ruins, and laid in the chancel. Light from the stained-glass window is just a bonus, of course. This isn't funny so much as it's just cool. Matthew Paris, who included this story in his Chronica Majora under the year 1254, was a monk of St Alban's himself, so he probably heard the story from the monks who witnessed it. "About midnight of the day of our Lord's circumcision [January 1], the moon being eight days old, and the firmament studded with stars, and the air completely calm, there appeared in the sky, wonderful to relate, the form of a large ship, well-shaped, and of remarkable design and colour. This apparition was seen by some monks of St. Alban's, staying at St. Amphibalus [a nearby shrine] to celebrate the festival, who were looking out to see by the stars if it was the hour for chanting matins, and they at once called together all their friends and followers who were in the house to see the wonderful apparition. The vessel appeared for a long time, as if it were painted, and really built with planks; but at length it began by degrees to dissolve and disappear, wherefore it was believed to have been a cloud, but a wonderful and extraordinary one." Later he observes "the apparition was believed at the time to be a sign of coming tempestous weather, and was followed by such a deadly disease among sheep and wild beasts, that the sheepfolds were void of sheep, and the forests of wild beasts". More Rupert Brooke. I'm not sure he quite knows what he's doing in this poem, especially the second verse, but it's rather sweet all the same. 'A disgraceful quarrel took place between the monks, and Turstin, the abbot, of Glastonbury, a man unworthy to be named, and possessed of no prudence... Among other doings, in his folly, he treated the Gregorian chant with contempt, and attempted to compel the monks to leave it off, and learn the chant of one William, of Pesehamp, and sing it; this they took to heart, because they had, both in this particular and in the other offices of the church, grown used to the practices of the Roman Church. The story of the Anglo-Saxon saint Cynehelm, better known as St Kenelm, is (if any part of it is true) a sad one. According to legend, he was the son of an eighth-century king of Mercia who was murdered as a child by his older sister, who wanted to inherit the kingdom in his place. 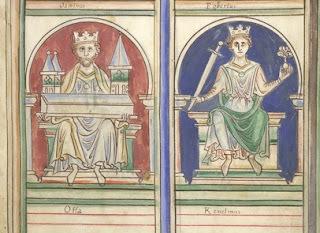 There are a good number of murdered royal princes with similar stories from the early Anglo-Saxon period - David Rollason (in ‘The cults of murdered royal saints in Anglo-Saxon England’, Anglo-Saxon England 11 (1983), 1-22) lists no fewer than twelve - but Kenelm achieved more fame than most; he was a well-known saint in the later Middle Ages, and the place of his burial, Winchcombe in Gloucestershire, was a popular site of pilgrimage. So that's the legend of Kenelm. He's mentioned by Chaucer in the Nun's Priest's Tale, because the prince famously had a dream warning him of his impending death - so Kenelm's story is cited as an example to prove that one ought to pay attention to dreams. Chaucer's learned cockerel Chaunticleer tells his wife "By God! I hadde levere than my sherte / That ye hadde rad his legende, as have I!" So if you take your reading suggestions from pompous, self-deluding chickens, here it is. 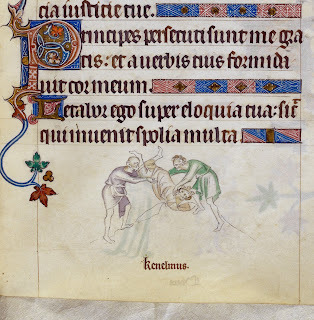 For more on Kenelm and his legend, see this excellent post. 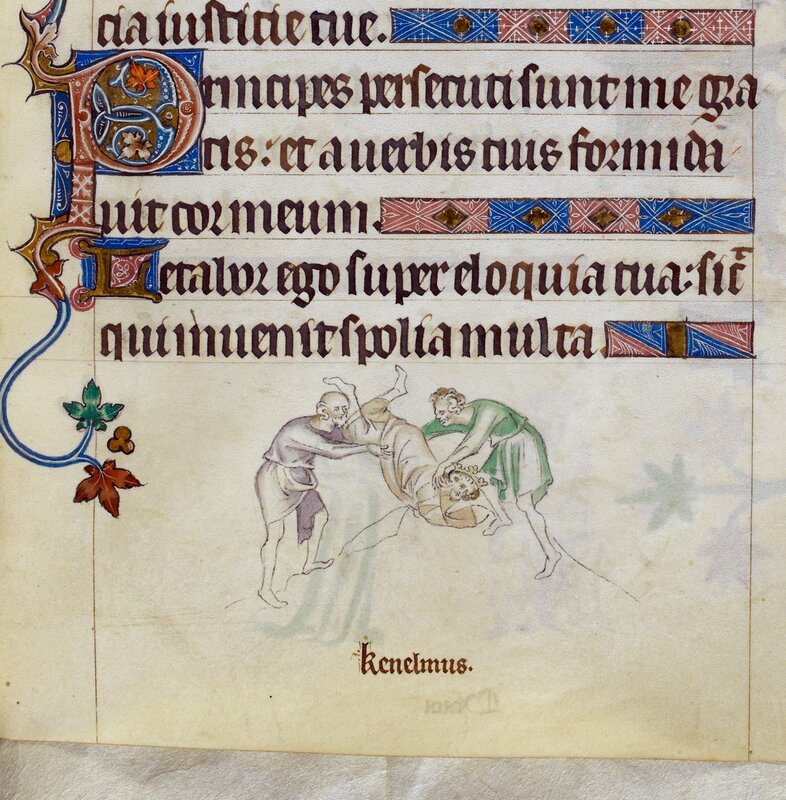 For many years, villagers [at Kenelstowe in Worcestershire] celebrated St Cynehelm's Day (July 17) with a village fair and the ancient custom of "crabbing the parson" - bombarding the unfortunate cleric with a volley of crab apples. The last clergyman but one who was subjected to this process was a somewhat eccentric gentleman named Lee. He had been chaplain to a man-of-war, and was a jovial old fellow in his way, who could enter into the spirit of the thing. My informant well recollects the worthy divine, after partaking of dinner at the solitary house near the church, quietly quitting the table when the time for performing the service drew nigh, reconnoitring the angles of the building, and each "buttress and coign of vantage" behind which it was reasonable to suppose the enemy would be posted, and watching for a favourable opportunity, he would start forth at his best walking pace (he scorned to run) to reach the church. Around him, thick and fast, fell from ready hands a shower of crabs, not a few telling with fearful emphasis on his burly person, amid the intense merriment of the rustic assailants; but the distance is small; he reaches the old porch, and the storm is over. Another informant, a man of Clent, states that he has seen the late incumbent, the Rev. John Todd, frequently run the gauntlet, and that on one occasion there were two sacks of crabs, each containing at least three bushels, emptied in the church field, besides large store of other missiles provided by other parties; and it also appears that some of the more wanton not unfrequently threw sticks, stakes, &c., which probably led to the suppression of the practice. The custom of crabbing the parson is said to have arisen on this wise. "Long, long ago," an incumbent of Frankley, to which St. Kenelm's was attached, was accustomed, through horrid, deep-rutted, miry roads, occasionally to wend his way to the sequestered depository of the remains of the murdered Saint King, to perform divine service. It was his wont to carry creature comforts with him, which he discussed at a lone farmhouse near the scene of his pastoral duties. On one occasion, whether the pastor's wallet was badly furnished, or his stomach more than usually keen, tradition sayeth not, but having eat up his own provision, he was tempted (after he had donned his sacerdotal habit, and in the absence of the good dame) to pry into the secrets of a huge pot in which was simmering the savoury dinner the lady had provided for her household; among the rest, dumplings formed no inconsiderable portion of the contents; whether they were Norfolk or apple dumplings is not mentioned, but the story runs that our parson poached sundry of them, hissing hot, from the cauldron, and hearing the footsteps of his hostess, he, with great dexterity, deposited them in the ample sleeves of his surplice; she, however, was wide awake to her loss, and closely following the parson to the church, by her presence prevented him from disposing of them, and to avoid her accusation ("a guilty conscience needs no accuser") he forthwith entered the reading desk and began to read the service, John Clerk beneath making the responses. Ere long a dumpling slips out of the parson's sleeve, and falls plump on sleek John's head; he looks up with astonishment, but having ascertained that his reverence is not labouring under the effects of an emetic ("vomits" they called them in those days), John took the matter in good part, and proceeded with the service; by and bye, however, John's pate receives a second visitation, to which he, with upturned eyes and ready tongue, responded, "Two can play at that, master!" and suiting the action to the word, he forthwith began pelting the parson with crabs, a store of which he had gathered, intending to take them home in his pocket to foment the sprained leg of his jade of a horse; and so well did the clerk play his part that the parson soon decamped, amid the jeers of the old dame, and the laughter of the few persons who were in attendance; and in commemoration of this event (so saith the legend), "crabbing the parson" has been practised on the wake Sunday from that time till a very recent period. In this year  it was revealed to a certain man in a dream that if he cut off his hands and feet, he would secure his eternal salvation; he accordingly did so, and immediately afterwards expired. "The men with long hair were, as we very well know, excommunicated by Father Anselm and banished from the doors of holy Church; yet now they so abound and so boastingly pride themselves on the shameful girlish length of their locks that anyone who is not long-haired is branded with some opprobrious name, called ‘country bumpkin’ or ‘priest'." 'Priest' - the worst insult you could give an Englishman in 1110? One of the most comforting of the psalms, appointed in the Book of Common Prayer for the fifth evening of the month. The first line is the source of the motto of the University of Oxford: Dominus illuminatio mea, the Lord is my light. The Lord is my light and my salvation ; whom then shall I fear : the Lord is the strength of my life; of whom then shall I be afraid? When the wicked, even mine enemies and my foes, came upon me to eat up my flesh : they stumbled and fell. Though an host of men were laid against me, yet shall not my heart be afraid : and though there rose up war against me, yet will I put my trust in him. One thing have I desired of the Lord, which I will require : even that I may dwell in the house of the Lord all the days of my life, to behold the fair beauty of the Lord, and to visit his temple. For in the time of trouble he shall hide me in his tabernacle : yea, in the secret place of his dwelling shall he hide me, and set me up upon a rock of stone. And now shall he lift up mine head : above mine enemies round about me. Therefore will I offer in his dwelling an oblation with great gladness : I will sing, and speak praises unto the Lord. Hearken unto my voice, O Lord, when I cry unto thee : have mercy upon me, and hear me. My heart hath talked of thee, Seek ye my face : Thy face, Lord, will I seek. O hide not thou thy face from me : nor cast thy servant away in displeasure. Thou hast been my succour : leave me not, neither forsake me, O God of my salvation. When my father and my mother forsake me : the Lord taketh me up. Teach me thy way, O Lord : and lead me in the right way, because of mine enemies. Deliver me not over into the will of mine adversaries : for there are false witnesses risen up against me, and such as speak wrong. I should utterly have fainted : but that I believe verily to see the goodness of the Lord in the land of the living. O tarry thou the Lord's leisure : be strong, and he shall comfort thine heart ; and put thou thy trust in the Lord. Another Robert Louis Stevenson gem. This is massively unseasonal, since 'St Martin's summer' is what is otherwise referred to as an 'Indian Summer', the unexpected last days of warmth in October/November (Martinmas being November 11th, if I remember rightly). But it's only a metaphor, you know! (See what I've learned from six years studying English literature). And anyway, this is just lovely. 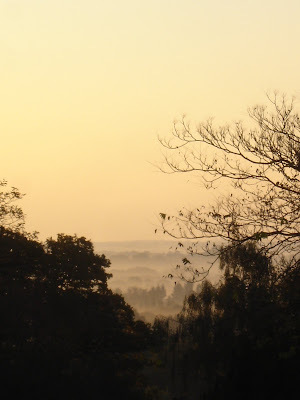 There's some danger that this blog may become just an excuse to swoon over the poetry of Rupert Brooke, but I promise to remember soon that I'm supposed to be a medievalist. But a couple of my favourites first - this was the poem of his I fell in love with as a thirteen-year-old romantic.